Photosynthesis, the process by which plants generate food, is a powerful piece of molecular machinery that needs sunlight to run. The proteins involved in photosynthesis need to be 'on' when they have the sunlight they need to function, but in the dark, when photosynthesis is not possible, they need to idle, like the engine of a car at a traffic light. They do this by a process called 'redox regulation'—the activation and deactivation of proteins via changes in their redox (reduction/oxidation) states. 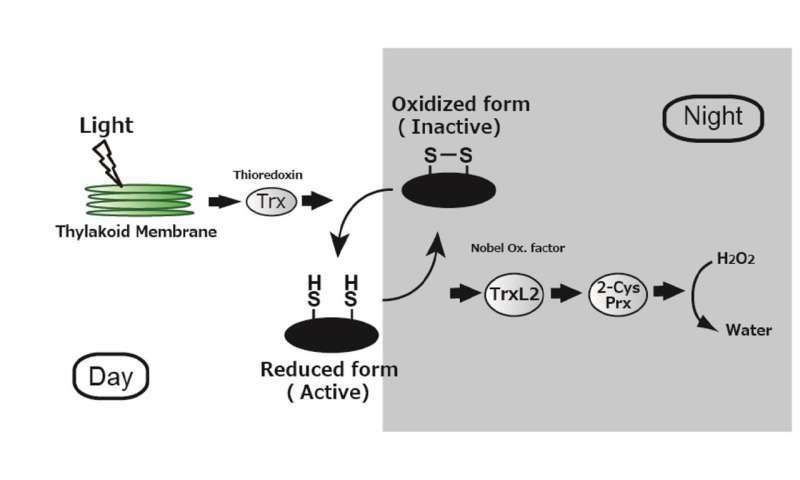 It's well understood that under sunlight, the ferredoxin-thioredoxin reductase (FTR)/thioredoxin (Trx) pathway is responsible for the reduction process, which activates the photosynthetic pathway. However, scientists have long been in the dark about what happens when light is not available, and how plants reset photosynthetic proteins to be ready to function when light is resumed. TrxL2/2CP do work in light as well, but are overshadowed by the normal activation machinery in plants and only take center stage in the absence of light. Interestingly, this cascade does not seem to affect photosynthesis itself, as mutant plants without 2CP behave normally in light; however, the 'switching off' mechanism is significantly less efficient in these mutant plants than in wild-type plants. Moreover, the fact that this process is less efficient, rather than absent altogether, suggests that other, as yet unknown, proteins serve similar functions in plants. The researchers thus shed light on how plants reserve the activity of photosynthetic proteins for when it's actually useful. If my hunch is correct, this process will take around 15 minutes to have the cell ready to photosynthesize again. This would explain why dark clouds passing overhead will cause the plants to stop photosynthesizing for that long before it starts back up again.